If your TV, VCR or DVD recorder only have analog NTSC tuners, and you receive your programs with an antenna, you now need a DTV converter box in order to continue to receive and record TV signals. Ordinarily, you would need a separate DTV converter box for the analog TV, VCR, and DVD Recorder. However, there is a way you can use just one DTV converter for all of them, provided your DVD recorder has an RF input - and there is additional catch as well that will be explained at the end. 1. Connect the cable from your antenna to the RF input (may be labeled "from antenna") on the DTV converter box. 2. Split the RF output (may be labeled "out to TV" or "to TV") of the DTV converter box into two separate feeds using a Two-Way CABLE SPLITTER. 3. Send one RF output feed from the splitter to the antenna/cable input on the VCR and the other RF output feed from the splitter to the antenna/cable input on the DVD recorder. If you are using a DVD recorder that does not have an RF input, then dispense with the cable splitter and send the RF output of the DTV converter box to the VCR and the AV outputs of the DTV converter box to the AV inputs (yellow, red, white) on the DVD recorder. 4. Connect the RF output feed from the VCR to the RF input connection on an RF modulator. 5. Connect the AV outputs (Red/White/Yellow) of the DVD recorder to the AV inputs of the RF Modulator. 6. Connect the RF output of the RF modulator to the Ant/Cable input on your TV. 7. Connect the AV outputs (Red/White/Yellow) of the VCR to one of the AV input sets on your DVD recorder. If your analog TV has a set of AV inputs (yellow, red, white) in addition to an RF input, you can connect the AV outputs (Red, White, and Yellow) of the DTV Converter Box to the AV input jacks on your TV. If your TV only has one audio input jack, use a "Y" adapter to combine the Red and White connections into a single audio input connection. This option is available only if you are not already using the DTV converter's AV outputs connected to the AV inputs of the DVD recorder. Receive and watch converted DTV channels on your TV either via accessing channel 3 or 4 on your TV or by using the AV inputs of your TV (if you have used that as one of your connection options). The picture quality will be slightly better from the DTV converter using the AV input option, but this your choice. Record converted DTV channels on your VCR or DVD recorder. Although executing the above connection setup using one DTV Converter with an analog TV, DVD recorder, and VCR allows you to still use all those devices in the digital TV age, there are limitations on what you can do with regards to watching and recording TV programs. For example, you cannot record two different channels at the same time, nor can you watch one channel and record another at the same time. 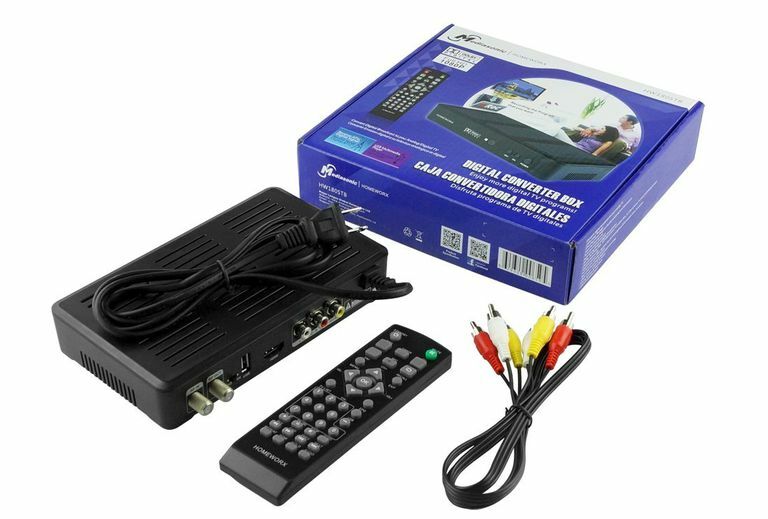 For this, your TV, VCR and DVD recorder would need their own dedicated DTV converter boxes or you would have to buy a new TV or DVD recorder with its own built-in DTV (ATSC) tuner. In addition, when using a DTV converter box, in order to do a timer recording on your DVD recorder or VCR, you must set the DVD recorder or VCR to record on Channel 3 or 4 at the time you want, and then make sure that the DTV converter box is set to the actual channel you intend to record. Leave the DTV converter box TURNED ON. If you want to record from VCR to the DVD recorder, you need to make sure that you connect the VCR's AV outputs (yellow, red, white) to the DVD recorder and select the DVD recorder's line input as your source. However, keep in mind that you can only copy home recorded videos. You cannot make copies of most commercial VHS movies as they are copy protected. For more details on video copy-protection, check out our companion article: Video Copy Protection and DVD Recording. If the setup options seem complicated, it just means that you may be trying to connect too many components to your old analog TV, given the DTV transition requirements. Ideally, you either need to have a TV with more input options and separate DTV converters for the TV, VCR and DVD recorder to get the maximum flexibility for both viewing and recording television programs. Alternatively, you could just buy a new DTV or HDTV and DVD recorder/VCR combo unit with an ATSC (HD) tuner already built-in. If you have a DVD recorder/VCR combo and either a DTV or HDTV with their own ATSC tuners, all you would have to do is split the antenna feed without having to go through a separate DTV converter box first. Then you would be able to receive and record TV programs and channels independently on either the DVD recorder/VCR combo or HDTV. In addition, since all DTVs and HDTVs have both AV and RF input options, you may not need an additional RF Modulator either. Whether you have an analog, HD, or 4K Ultra HD TV, if you have a VCR and DVD recorder and subscribe to Cable or Satellite that definitely complicates things further as most channels and programming from those sources are copy-protected which prevent recording onto a VCR or DVD recorder. It is best to take advantage of DVRs that cable and satellite services provide for the recording and temporary storage of programs. Also, you may not be able to copy recordings from a cable/satellite DVR to a VCR or DVD recorder as copy-protection is usually implemented that, although allowing an initial recording to a DVR, will prevent a further copy to be made on VHS tape or DVD. To find out if you are able to use your VCR or DVD recorder with your cable or satellite, contact customer support for your specific service provider.